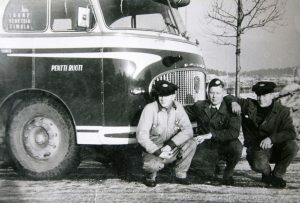 Founder of the company, Pentti Ruoti, was a driver by day and fixed cars during the night. Being an entrepreneur in the 1950’s was demanding work. 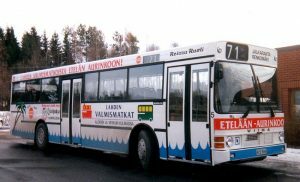 Children and grandchildren remember Pentti always replying “I’m on it as long as equipment lasts” to customers asking for coach services. Over 60 years later and the coaches are still cruising along the roads of Finland and abroad, so he managed to do it well. The sixties were slippery years with difficult conditions, but we managed to stay on our tracks. Pentti started the Renkomäki-Lahti central route already in 1957. Later in the 60’s the route was extended to Renkomäki-Lahti center- Jalkaranta. Line 71 was the longest route managed by one operator in Lahti and it was operated for over 50 years until 2014. Until this route was cancelled, Ruoti operated lines 71, 72, 73 with five coaches. Reissu Ruoti started strongly to develop its charter equipment. Trips were made to various locations abroad and domestically. Matti Ruoti concentrated on developing the charter equipment and in the process wanted to change the name of the company. 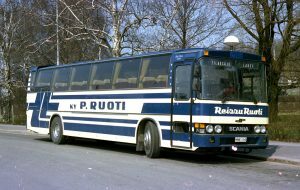 Ky P. Ruoti was reborn and the company got the name it is known today: Reissu Ruoti. Scania Delta 300 pictured here was the first charter coach in Scandinavia which was equipped with VHS-recorder and a color-tv. In that time, it wasn’t common to have those even in every house, let alone in a coach, so it was something very special. Matti’s younger brother Pekka was also involved in the business all the way until 2000 when Pekka sold his shares to Matti’s family. In 1974 Matti’s wife Terttu got a license to drive a coach and she was a regular sight behind the wheel after that. Terttu was the first female driver in the company and most likely one of the first in Finland. 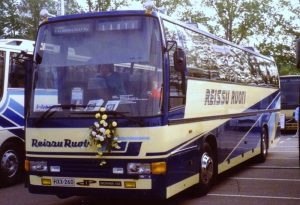 A brand-new Scania Delta was welcomed and taken into use at Lahti Coach Expo 1987. The 1980’s were a time of rapid growth for the company. Number of trips abroad were up significantly when the economy in general was booming and Finns were more and more interested in travelling. In 1985, Lahden Valmismatkat was founded by Markku Peltonen and Matti Ruoti. Valmismatkat turned out to be an instant success and Travel packs were one of the most popular products of Ruoti in the 80’s. 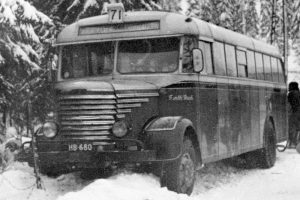 Ruoti coaches were a common sight on the roads in Finland as well as abroad. We have also run the local traffic routes with years of experience. In the 90’s we just had more colorful decals, don’t you think! In 1990 the third generation of the Ruoti-family Jouko, Jukka and Juho started to take stronger roll in the company. Jouko had a strong developing take on the local traffic of Lahti while Jukka renewed and developed the charter. As the youngest of the brothers, Juho, continued to study and got acquainted with their area of business. Generations change, cars develop, and the journey continues. Family has always been vital to the company. Throughout the years family members have always worked as drivers and mechanics, in sales as well as organizing service and in the management. 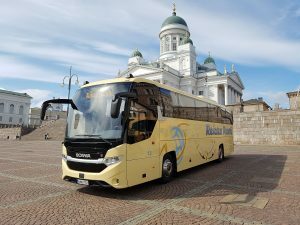 Outsourcings have opened new possibilities for the company both in local traffic and in charter and at the same time given them interesting new partnerships and clients in the Päijät-Häme region as well as increasingly in the metropolitan area.